GROUP D REVIEW: Chekhovskie Medvedi broke their eight-game losing streak and won their first game of the season, 29:26, against HC Metalurg. Seeking a group phase knockout berth, Metalurg had little room for mistakes against a winless Chekhovskie. But the hosts had an unexpected slow start, and ultimately, their game never got going, allowing the Russian "Bears" to earn their first win of the season. Medvedi's last win in the competition was on the 19th of November last year. Left back Dmitrii Santalov was Medvedi's top scorer, with seven goals. Metalurg are now three points behind Motor, who are in second place. With an eight-game losing streak, and no win in the VELUX EHF Champions League since 19 November 2016, it seemed as if Chekhovskie were on the brink of tying their 11-game winless streak, which was their worst run without a win in the European top flight competition. The Russian champions were the underdogs in the game against Metalurg. 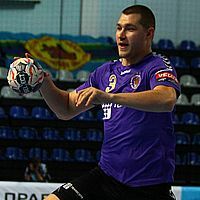 Despite this, it took them six and a half minutes to score their first goal, as Chekhovskie took a surprising 5:1 early lead, that prompted coach Aleksandar Jovikj to take a timeout for Metalurg. With young right back Dmitri Santalov in superb form, the Russian side managed to keep their opponents at bay 8:3, after 14 minutes. As the hosts desperately tried to make a comeback, they improved their offense, but their defence could not find the answer to Medvedi's attacking prowess. The Russians took a surprising17:12 lead at half time. There was no comeback for Metalurg, except for a 3:0 run that brought the hosts to within a three-goal difference, 21:18. But the young Medvedi side managed to keep their composure and they got their first win after 351 days in the VELUX EHF Champions League, 29:26.